Making a success of a startup business is no easy task. For every success story we hear about, there are many more that fail. Just as being able to build a brand is a key asset of entrepreneurship, so is being able to tell when the writing is on the wall and being honest enough to admit when a venture hasn’t worked. If your startup hasn’t traded or changed its name in the last three months, isn’t threatened with liquidation and has no agreement with creditors, you may decide to close it down by getting it ‘struck off’ the Companies Register. 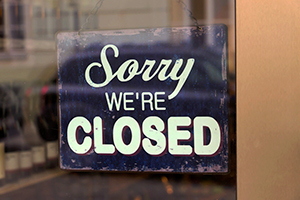 This is the most common way to dissolve a limited company, but as well as needing to satisfy the above criteria in order to be eligible you have certain responsibilities to close down your business properly when you apply to have it struck off. Before submitting your application, you must close it down legally. This involves telling interested parties and HMRC, ensuring that your employees are treated according to the rules and dealing with your business assets and accounts. A copy of your application to strike off must be sent to anyone who could be affected within seven days, which includes your members (who are usually your shareholders), creditors, employees, managers or trustees of any employee pension fund and any directors who didn’t sign the application form. If you employ staff you need to follow the rules if you make any of them redundant and pay their final wages or salary. It’s imperative that you tell HMRC that your company has stopped trading and is in the process of being dissolved. Once the final balance of PAYE and National Insurance has been paid, you can ask HMRC to close down your payroll scheme. Any assets that your business has should be shared out among the shareholders before the company is struck off. If there are any left over these will go to the Crown and you’ll have to restore the company to reclaim them. Although you don’t have to submit final accounts with Companies House, you do need to file them together with a Company Tax Return to HMRC. If your business has made a loss in your final year of trading, you might be eligible to offset the tax owed against any profits made from previous years. This is known as ‘terminal loss relief and can be claimed on your final tax return. You might be liable for Capital Gains Tax on any assets that you take out of the company before it’s struck off, although you might be entitled to some tax relief through Entrepreneurs’ Relief. Even after your company is struck off, you must retain business documents for seven years. If your company employed people, you must keep copies of your liability insurance policy and schedule for 40 years from the date of dissolution. To submit the application for your company to be struck off you must send Companies House form DS01, which must be signed by a majority of the company’s directors. If form DS01 has been completed correctly, you’ll receive a letter from Companies House informing you of this. Your request for your company to be struck off will then be published as a notice in your local Gazette as an official public record. Provided nobody objects, your company will be struck off the register after three months. Once this has passed, a second notice will be published in the Gazette to confirm that your company no longer legally exists. As well as providing limited company formation and startup accountancy packages, The Company Warehouse also provides a service that completes the steps necessary to affect a company strike off. For more information, contact one of our Consultants on 01245 492777.